President Moon Jae-in expressed the hope Monday that U.S. President Donald Trump and North Korean leader Kim Jong-un can build off their first meeting to make “more specific and substantial progress” at their second summit, which he believes could help advance inter-Korean relations. “Beyond bringing a lasting peace with no threat of war threat, the two Koreas should open an era of economic prosperity with peace creating new growth engines,” Moon said in remarks at the start of a weekly meeting with senior presidential secretaries at Cheong Wa Dae, according to press pool reports.”Chances are that talks aimed at bringing a lasting peace on the Korean Peninsula are gathering momentum. This, which is happening for the first time since the end of the Korean War, is a chance that South Korea can’t afford to lose,” the President said, referring to the upcoming summit between Trump and Kim later this month in Hanoi, Vietnam. Moon urged citizens and politicians to stay strong to “make that happen.” “Nothing can be achieved through luck. We have to be united and prepared. Over the last year, South Korea has taken center stage in facing many challenges. This wasn’t a coincidence as we thought that bringing long-lasting peace to the peninsula was the right thing to do,” the President said. 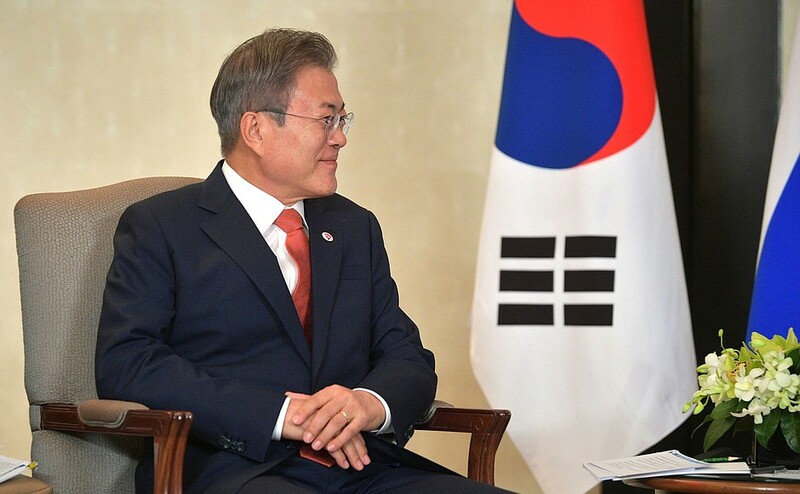 Moon said leaders of the United States and the Koreas were behind seeking a permanent peace on the peninsula, ending decades of hostility. “The leaders are dedicated to the right side of history. The upcoming summit between Trump and Kim will go further than the previous one,” he said. Moon stressed the upcoming summit scheduled for Feb. 27 and 28 in the Vietnamese capital will mark a “turning point” in advancing complete denuclearization of the peninsula, establishing new relations between Washington and Pyongyang and pushing peace forward both substantially and visibly. “The reality is that there are doubts about the progress in the disbanding of North Korea’s nuclear program. I truly expect the second meeting between Trump and Kim will produce historical results, which will help the peninsula become a land of peace and prosperity free from conflict and hostility,” he said. The President has heavily invested his personal legacy in the ongoing peace process and is keen to cement economic relations with the North, but he has been stymied by the slower pace of rapprochement between the United States and North Korea. In a Twitter post, Trump said; “North Korea, under the leadership of Kim Jong-un, will become a great Economic Powerhouse. He may surprise some but he won’t surprise me, because I have gotten to know him & fully understand how capable he is. North Korea will become a different kind of Rocket ― an Economic one!” Washington and Pyongyang are narrowing key differences ahead of the upcoming meeting. U.S. envoy Stephen Biegun met with his North Korean counterpart Kim Hyok-chol last week in Pyongyang, to discuss preparations for the summit and ways plan to reinvigorate nuclear disarmament talks. A Cheong Wa Dae official said the North Korean leader plans to make a state visit to Vietnam before or after his meeting with Trump, though presidential spokesman Kim Eui-kyeom declined to confirm this. While Washington states Pyongyang has yet to take concrete steps in giving up its nuclear weapons, the North complains that the U.S. has done little to reciprocate it for the freezing of nuclear and missile testing and the dismantling of some facilities. Pyongyang has repeatedly demanded a lifting of sanctions, a formal end to the Korean War and security guarantees.